Such beautiful butterflies! I love them. Ours have all finally started on their migration to the South. I look forward to seeing them again in a few months in the Spring. Shelly, your card is gorgeous! I love the colors and the different paper patterns you used. The butterflies are so pretty and the lacy die cut between the butterflies and the background paper is so pretty too! Thanks for sharing your creativity! 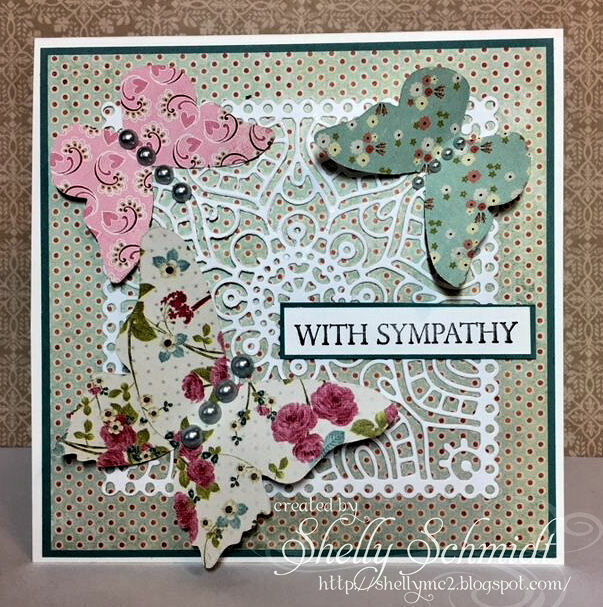 A beautiful sympathy card Shelly! I love your design! Shelly, your card is very pretty! Love the way you used DP to make the butterflies. Thank you for doing such a great job with my theme! 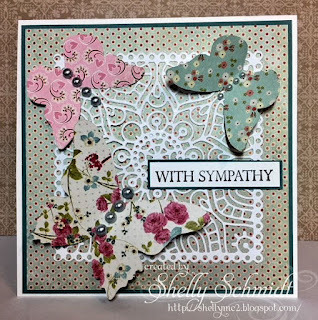 Shelly that die and the butterflies are so gorgeous on your beautiful card.